Lamborghini are well known for performance cars but the first Lamborghini engine was fitted to a boat back in the late 60's. Ferruccio Lamborghini decided to try out the Espada engine on a newly-designed boat by designed by Eugenio Molinari. Due to the difficult years in Automobili Lamborghini, production came to a halt and Ferruccio Lamborghini decided to commission Ing. 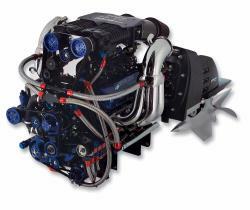 Alfieri to design a new engine, a 12 cylinder 8,200 cc, for offshore racing. It was in 1984 that Lamborghini made it's stand in offshore powerboat racing. Since then the technical development has evolved from carburettor to the actual injection engine flanked by the 4-speed to the 6-speed gearbox until the 2001, the year in which the latter was banned from the Sporting Regulations. The first 10 years of involvement in offshore racing saw an amazing 88 wins for the Italian company. The HP1075 was run by the Highlander team for the last few races of the 2004 season. The engine was not legal for the 2004 season due to many technical advances but it has now been approved by the UIM and was used by Ugland Offshore Racing's boat for the 2005 season. In 2006 Team Qatar will also run the engine in their boats. The engine is a V8 monster and creates 1075 HP (as well as an impressive sound whilst racing). This enormous power is controlled using the Mercury exclusive Propulsion Control Module (PCM) 03 microprocessor. The 1075 SCi comes equipped with the digital SmartCraft Controller Area Network (CAN) system, a network of sensors that proactively monitor engine functions. The next wave in boating, SmartCraft Integrated Marine Technology from Mercury links power, controls and internal and external sensors to provide precise data on all boat functions at a glance. The system monitors a variety of vital engine functions including fuel flow, fuel range, fuel used, and RPM, along with water depth, trim angle, water pressure and battery voltage. Boat functions monitored include fuel tank levels and water and waste tank levels. The PCM 03 also drives the exclusive Engine GuardianTM System. Engine Guardian monitors engine functions to forewarn of possible problems that could lead to engine damage. This "smart" technology not only detects and alerts the boater of a problem; it processes the data and reduces power to a maximum, safe level that allows the boater to continue operation. Engine Guardian also has the ability to proactively help prevent engine overheating by sensing not only engine temperature but cooling water pressure as well. By sensing water pressure, and temperature, the system can provide advanced warning to the PCM 03 control module, which then reduces engine power before temperature related engine damage takes place.